A coalition of tribal groups says sea lions are eating far more salmon along the Columbia River than previously thought. The claim comes in a legal fight over whether wildlife officials should be killing some of the hungry sea lions. A federal judge has authorized wildlife officials in Oregon and Washington to kill as many as 30 California sea lions each year near the Bonneville Dam. Four have been killed so far this spring. A conservation group has filed a lawsuit in an attempt to stop the killings. Now, a coalition of tribal groups has filed a legal brief in defense of the program. 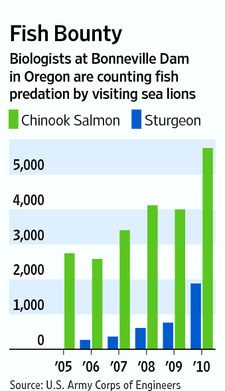 The tribes claim sea lions are munching even more salmon than fishermen are catching. Doug Hatch is the senior fisheries scientist with the Columbia River Inter-Tribal Fish Commission. He says prior estimates were based solely on observations made near the base of the dam. "That's the only place where there's this program in place to very thoroughly document predation, but predation is happening throughout the lower river," Hatch says. The Humane Society of the United States, which filed the lawsuit, doesn't buy that argument. The group's Sharon Young says sea lions consume the bulk of their fish dinners at the dam, so the current number is accurate. Tribal Group Claims Sea Lions Munch More Salmon Than Previously Thought <-- Listen at original site.